Our host at WSB explained why everything in the building looked so new: it was all built in the early 1980s along with the mall. The old transmitter building (of which nothing but the window shown earlier remains) was located where this chain restaurant now sits. The land, by the way, is still owned by Cox. 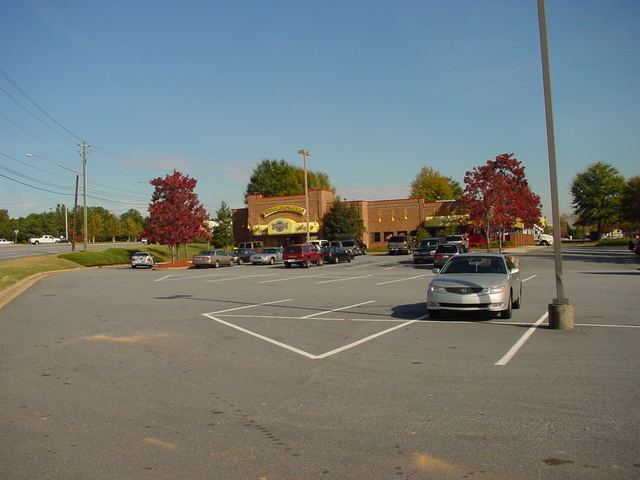 The mall's developers approached the station in the late 1970s and asked how much it would cost them to buy the land. Cox offered to lease it to them instead, on the condition that they build a new transmitter building for WSB and pay for all the costs of maintaining the ground system and dealing with RFI in the mall buildings. The developers bit, and so the rest is history.